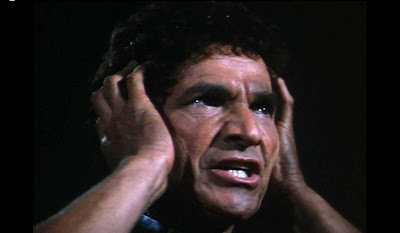 #1; Romulan Commander, Star Trek "Balance of Terror"
#2:Sarek, Star Trek "Journey to Babel"
#5:Mr Slater, Incredible Hulk, "Captive Night"??? #6:Commander Perel Sightings, otherworld, "The Zone Troopers Build Men"
I am confidant for my first 3 and for Urko, but the 5th and 6th ones are real shots in the dark. 1. Romulan Commander from "Star Trek: Balance of Terror"
2. Sarek in "Star Trek: Journey To Babel"
4. Urko from "Planet of the Apes"
5. Ambassador Duvoe from "Buck Rogers: Journey to Oasis"
6. Commander Perel Sightings from "Otherworld: The Zone Troopers Build Men"
1. Romulan Commander: Star Trek (OS), BALANCE OF TERROR. 2. 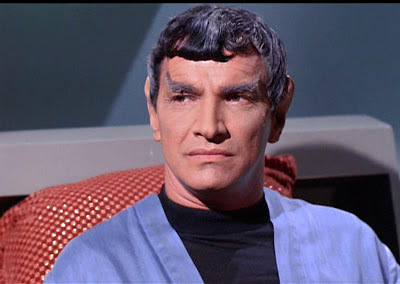 Sarek: Star Trek (OS), JOURNEY TO BABEL. 4. 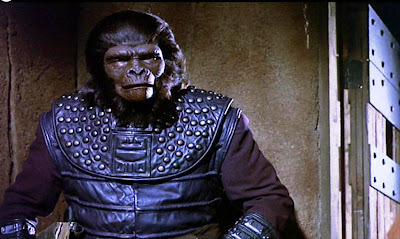 Urko: Planet of the Apes (t.v. series). Can't name the episode, though. 5.Duvoe: Buck Rogers in the 25th Century, OASIS two parter. Top picture Star Trek:Balance of Terror as the Romulan Commander. 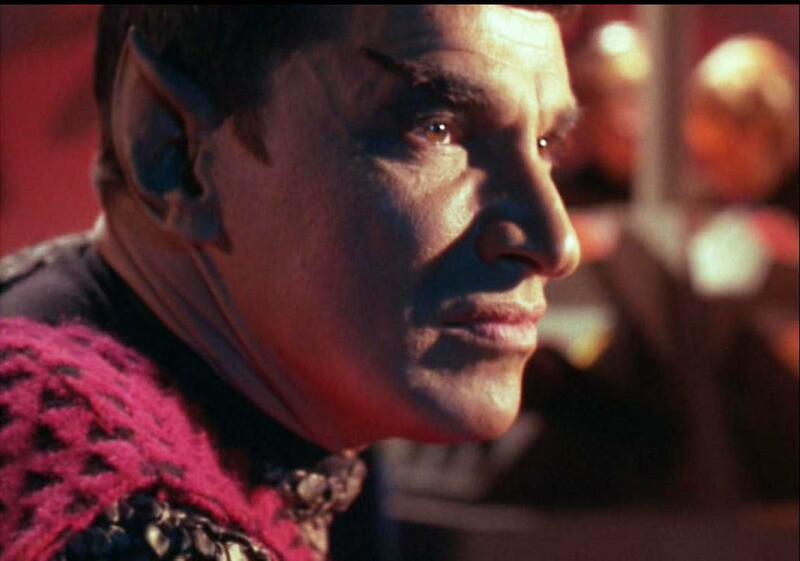 2nd phot as Sarek from Star Trek the original series. I'd say picture 3 looks like an episode of Mission Impossible. 4 is Urko from Planet of the Apes. % is from Buck Roger's in the 25th Century and the last one is from Otherworld:The Zone Troopers Build Men I think !! If only there was some sort of clue as to the origin of picture No.4. Great job recognizing the various roles/episodes of Mark Lenard. Dan Briggs: you were the first to get all the roles save for # 5. Congrats. Howard - you got all the roles right, including # 5, which was Duvoe from Buck! But everydone did a fantastic job!!! 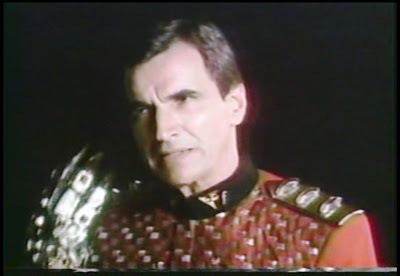 I never noticed before how similar Mark Lenard looks to Martin Landau. It's funny you mention that. 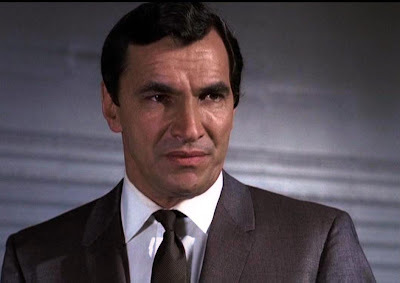 I've always thought there was a similar appearance/physicality among Lenard, Landau, Leonard Nimoy and Jonathan Frid. They are all the same type; with similar coloring even. Great character actor, who I'll always think of first and foremost in the Screen Gems TV series "Here Come the Brides" (1968-70). Lenard played a "good bad-guy" named Aaron Stempel, who owned a sawmill in tiny 1870s Seattle. He and Jason Bolt (Robert Brown), who along with his two brothers, had the biggest logging operation in the area, were usually at "loggerheads" over the future of Seattle, and who would run things. While early episodes showed Stempel as a rather greedy and unpleasant sort, he did "mellow" as the series progressed, and often ended up siding with the Bolts when the future of Seattle was at stake. "Star Trek" fans who've never seen "Here Come the Brides" may still remember his Aaron Stempel character from the "Star Trek" book "Ishmael" by Barbara Hambly (1985). 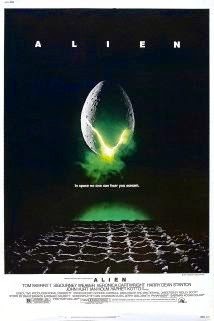 This strange installment brought the "Star Trek" characters together with the "Here Come the Brides" characters, in a surprising, but ultimately enjoyable plot. The USS Enterprise has to do some "time travel" back to the past, and ends up in the 1870's Seattle of "Here Come the Brides". The book suggests that Spock's mother Amanda was a descendent of Aaron Stempel! Thus, in a sense, Mark Lenard was both Spock's father, and an ancestor of Spock's on his mother's side! Other strange tie-ins are Jane Wyatt, who plays Amanda, also appeared in a "Here Come the Brides" episode. And Robert Brown, who was the star of "Here Come the Brides" as logger Jason Bolt -- guest starred in "Star Trek" as Lazarus! Hmmm.... maybe Jason Bolt was an ancestor of Lazarus? Both seasons of "Here Come the Brides" are now available on DVD, and I would recommend it to anyone, "Star Trek" fan or not! It's a whimsical mixture of comedy and drama, based (very very loosely!) on an actual event in Seattle's history, when an enterprising young man named Asa Mercer went back East (actually he made 2 trips) to induce young women to move to the wilds of Seattle, where men greatly outnumbered women. Seattle-ites of today would recognize Mercer's name, given to a main street downtown, and to Mercer Island in Lake Washington. The show also starred teen idol Bobby Sherman, and future TV star David Soul, as Jason Bolt's younger brothers. Henry Beckman, who had a small but pivotal role in 1965's "The Satan Bug" as the director of the secret biolab, is a comic joy as the drunken, reprobate sea captain who brings the brides to Seattle and decides to stay.